In order to achieve success, students must enjoy the music they're playing. First Performance Plus is a collection of tunes that young instrumentalists will love. First Performance Plus includes 13 Songs for Beginning Band from grades 0.5 to 1.5 that represent a variety of musical styles including rock, swing, marches, and traditional folk songs. Each piece was composed or arranged especially for first and second year band students to provide a repertoire of varied, fun, and exciting concert, contest, and festival music. 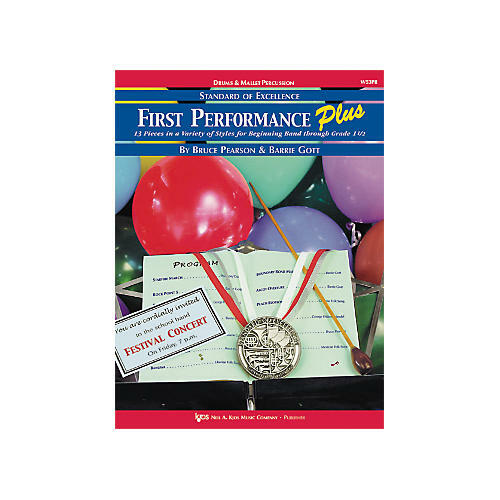 Whether or not you've used First Performance, First Performance Plus will help develop a students positive association with music. Scored for drums and mallets.